Retro Bach + Fresh Water Hot Tub or Plunge Pool. Cute retro bach, set behind the sand hills of Tirohanga's Hikuwai Beach, on 3 acres of grass land. Fresh water hot tub makes for an amazing place to star gaze, or cool off in the summer months as a plunge pool. Google "Kiwitub." 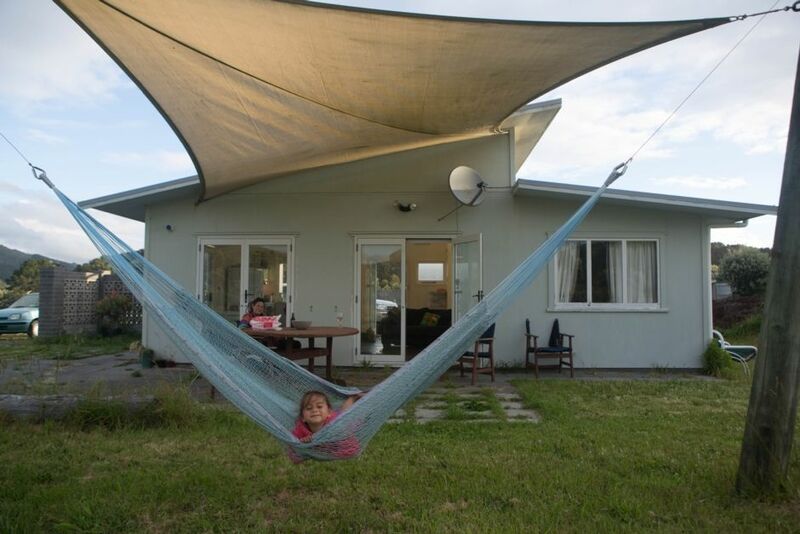 Property is 5km from the Opotiki township, which has cafes, sushi bar, supermarket, second-hand stores, movie theatre etc. Or the Tirohanga general store is around 1km away. (Great place for ice creams.) If you are into mountain biking the Motu Dunes track goes right in front of the property. This is of "easy" grade so great for most abilities. It is 10km in total but links to a loop of many different tracks, right up to the 91km full loop, for the ultra keen and fit. There are however multiple other tracks, including a few which are 10km or less. It is now most likely that you will see a Weka, (small native hen-like bird) or certainly hear them. They are fascinating to watch and are very cheeky. The region has some amazing places to visit. Fresh water swimming holes where some of the Motu Trails tracks wind through. If bush walks are more your thing, you will not be disappointed. Fishing off the beach can be very rewarding too. Or simply take a drive along the Pacific Coast Highway and explore the Cape. Please note; I do have an on-site caretaker who has a seperate private area, but he is 150 metres from the bach. (Further than the closest neighbour.) Your privacy is my priority! Smoking allowed outside only. Pets allowed with prior approval. Plenty of tent space, although prior approval needed. Beside Motu Dunes cycle trail. Beautiful spot with cheeky Weka near by. Great walking biking tracks and a beach with wow factor. Would definitely book again. Very helpful hosts if you need anything. Great house with doors opening all sides. Thank you we loved it. Other than, that this bach might need a bit of a spring clean, we have nothing to complain. It offers everything you need for a relaxing get away. Communication was easy and good, we felt well taken care off. Having our dog with us was no issue (she had the best time of her life there :) ). The bed is comfy, the hot tub amazing and the beach is only 5min away. Loved to be able to listen to our music while chilling in the hammock. Great location..close to beach and secluded. Would live here if I could. Fantastic property,Everything we needed, great private location and a Lovely hot tub. Fantastic property,Everything we needed, great private location and a Lovely hot tub..
Super comfy bed..All in all we felt at home..